Two nights ago, I sat down at my computer without really knowing what to play. Lord Crumb was working so Dying Light was out of the question, and I wasn’t particularly leaning towards anything else. I know I have a ton of games to play, especially on Steam, so I had some choice paralysis going on. As I browsed my games list, I suddenly remembered Ironweakness publishing several posts about Trove recently and the fact that I did have it installed. You see, I bought a starter pack back when Trove was still in alpha, and while I found it a fun little game, I soon got distracted by other shinier games and forgot about it. 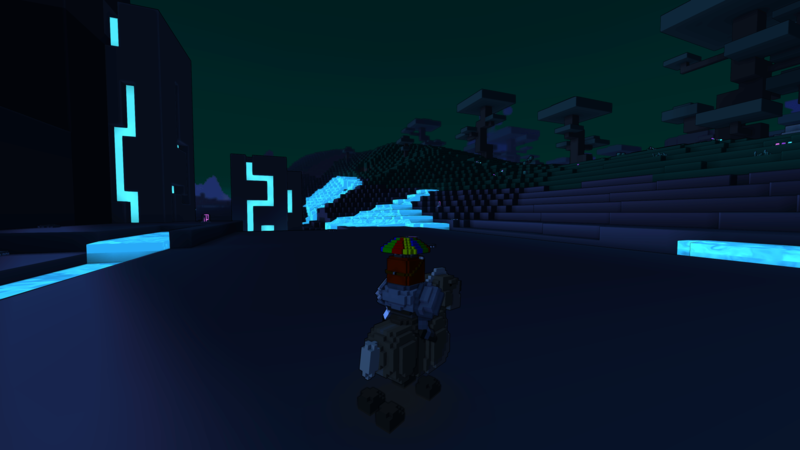 There was a brief period when they released the dracolyte class where I drifted back to it for a evening or two, but the fact that all of my previous progress had been wiped was too depressing at the time (completely my fault since I knew it was going to happen). But now Trove has set launch date for July 9th and it looks like there will be no more wipes, I figured it wouldn’t hurt to give it another try. I have to say, there’s been a hell of a lot of stuff added or changed since I last played that it feels almost like a brand new game. I thoroughly enjoyed playing it for several hours the last two evening and I’m looking forward to playing it again in the future. Here are some of the things I like about it. Anyone who knows me from my WoW days knows that I love alts and switching up playstyles. Which is why it’s so great to be able to play different classes on the same character. No need to worry about logging in and out, inventory management, and who has what tradeskills because it’s all on the same character. This is my second favorite level/skill system right after a skill-based system. So far I’ve tried out the knight, gunslinger, dracolyte, and shadow hunter. I would try out more but I need to earn more cubits (in-game currency) first. My knight is my current favorite. Only a lot easier because you only have one tool for the job (a laser), and you automatically pick up the blocks without having to run over them. Building materials also don’t take up space in your regular inventory. I hit Z and boom, I’m instantly mounted. No waiting for a castbar to finish. There are also a lot to choose from. So far I have a horse, a raptor with mittens and a Santa hat, and a fiery dragon sled thing. 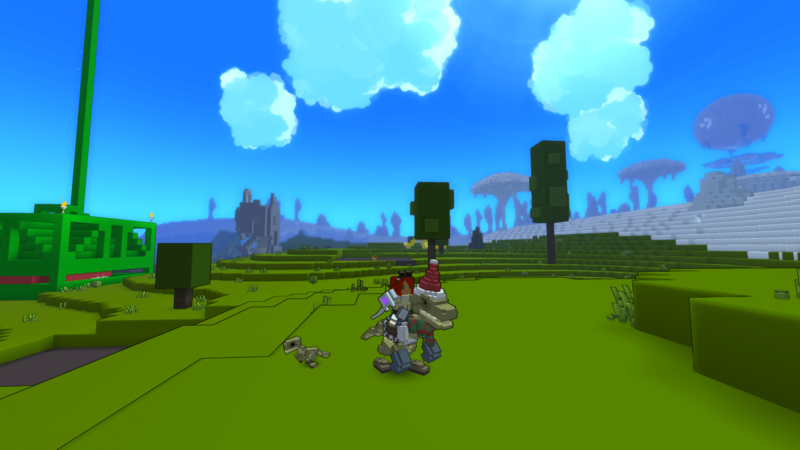 You can see my little raptor minipet in the screenshot above. That’s just one of many that you can collect. They also give you different stat boosts (small ones but a cool feature nonetheless). Any large distinct structures are likely to be a dungeon and most of them are pretty quick to clear out. It can take anywhere from 10-30 minutes depending on the size and I had no problems clearing any of them out on my own. Each biome has its own unique designs, all of which are hard to miss when you’re out and about. All that dungeoning often left me with a full inventory and few health flasks left. I only had to find an empty cornerstone plot nearby to instantly place my house containing free flask refills and my personal chest as well as a number of portals in case I wanted to go somewhere else. I haven’t done much with mine yet so it’s still the default player house. There are currently 11 biomes, some of which are your relatively standard forests, volcanoes, and snowy tundra. Then there are ones that are entirely made out of candy or look like something out of Tron with dark backdrops highlighted with neon rivers. The biomes are rather small and so startlingly different that I never felt like I was seeing too much of one landscape for long. But is it safe to drink? For every class, there’s your standard attack plus 3 other abilities that unlock as you level. That’s it, 3 special attacks. Not 29383747 abilities that you have to find room for on your bars (one thing I always disliked about WoW). Combat is more about learning how they work in combination and avoiding enemy attacks. As well as a lot of jumping. 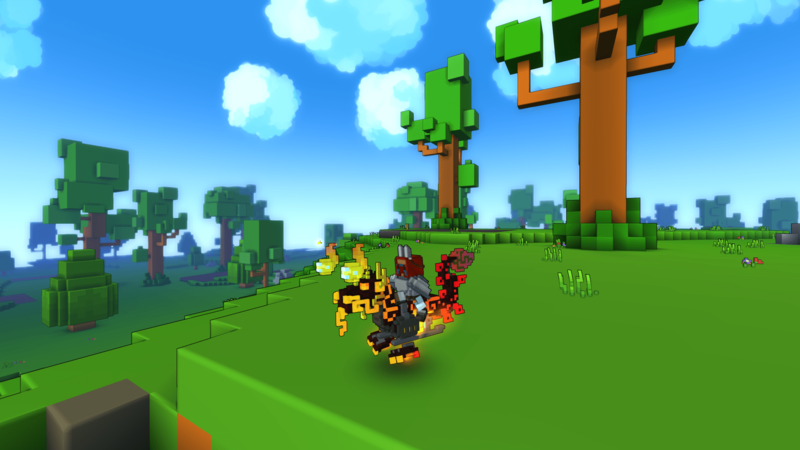 I know that “cash shop” is a dirty word when it comes to F2P MMOs, but I quite like the way that Trove has done theirs. A lot of items have both a Credit and Cubit cost. Credits are bought with real money, Cubits are earned in game through various means. So you can buy all of the basic items you need without having to spend a penny. It just might take longer. A common hook in F2Ps now seems to be lockboxes that drop randomly and require a key in order to open…a key that you have to buy with real money. Trove has a much better concept they call adventurer’s boxes which do not need keys and just have a chance to give you awesome loot. The first time I noticed them was when I was cleaning out my inventory. I don’t even remember picking them up. I don’t know what sort of odds they have on them but I only opened about 6 of them before receiving this really cool dragon mount. Which is also a sled or motorcycle or something. There’s so much I haven’t even touched yet such as gardening, fishing, ringcrafting, other classes, boats, mag riders, wings, club worlds, and the end game. 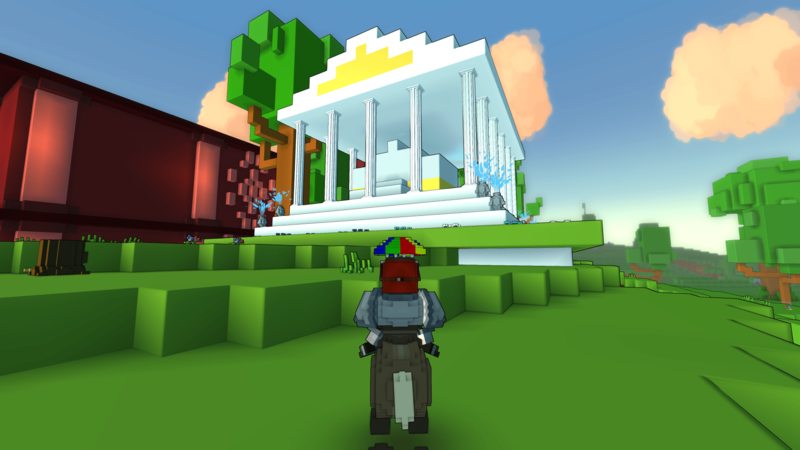 Trove is by no means something that I would consider for a main MMO. I have too many non-MMO games to play anyways. But it is a quick and fun distraction when I just want to explore and go dungeon-delving. 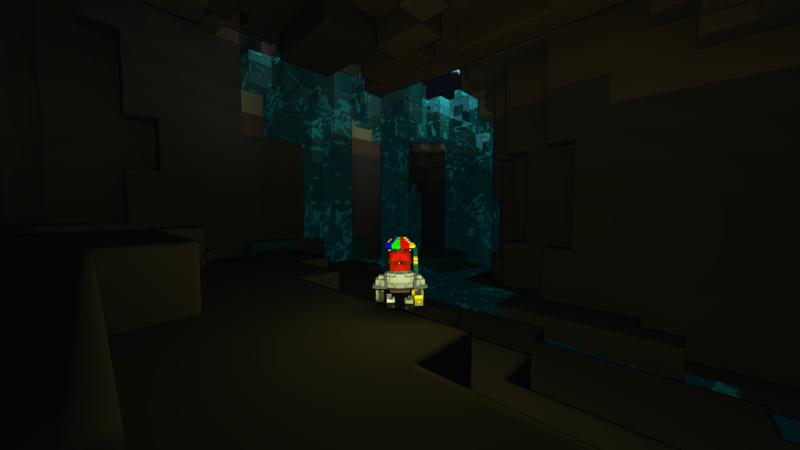 Great write up, I’m glad to see more people giving Trove a first (or second) look. With the patch yesterday I think they are really close to the launch version as well. You mentioned pets with stats, I just learned recently of a group of pets you can craft out of old boots that you obtain while fishing, the pets each have 2 stats, one varies based on the style boot you craft but the other is always jump, I think 8-10 which is actually a considerable boost. I like that pets have a little utility in this game as well as being fun to collect. Right now this kind of is my main MMO, although like you I always saw it as a side fling so I’m not sure how long it will stay my focus. But there is definitey a surprising amount of things to do in this “MMO concentrate,” as Kunzay at Party Business called it. Anyway, nice to read of other experiences with the game. I think at least 4 bloggers are giving it a look right now which is great. If you keep playing, I’d love to hear more of your thoughts on the game. I was going to say that it’s a bit too grindy for me to play as a main MMO, but then I’ve had Wurm Online as my main in the past and that’s SUPER grindy. So I’d like to take back my comment and say that it really could be a main MMO. Either way, it’s been a lot of fun so far and I’d like to thank you for reminding me of it. Thanks for mentioning the pet tip too! One thing I really loved about my previous plays was stacking jump so I could get up to ridiculous heights. I had noticed that there seemed to be less of that stat on the new gear but I thought maybe it was just the drops I was getting. It’s good to know that I can get it back! I’ll definitely have to look into that. I have 23 jump on my gear and I think with one of the pets I can add 10 more. Or I could focus combat stats on my gear but still have the luxury of extra jumps. It’s definitley a star I enjoy, I consider travel ease a type of progression because of it. As you level extra jumps, bombs, mounts, then wings amount to some interesting and efficient travel methods. And yeah, I do see the potential for a lot of grind now that I’m exploring more of what the game offers. I don’t consider the leveling and gearing a grind because it’s just fun, and I think of grind as necessary but usually boring repetition required for an end goal. But the mats you need for crafting everything or expanding a club world or building are just insane. You either have to play A LOT or be satisfied with one goal at a time (which is the route I’m taking). Gathering is kind of fun, but not to that extent. Wow, that is a heck of a lot of jump. I got 4 on one of my piece of equipment and I’m just happy with that so far. I am looking forward to getting wings though, they look like a lot of fun. Well, a couple of other bloggers and I are trying to team up a little. My name is Aldorf in game and if I’m playing it’s usually around 10pm EST. We have a club word “Waiting For Rez” if you want to join. It’s a tiny island with nothing else right now but we’re working on it. I was thinking it could be a common club for bloggers interested in the game. If you can’t get ahold of me in game, you can PM me on Twitter, @Ironweakenss and if I’m available I’ll log on and add you.